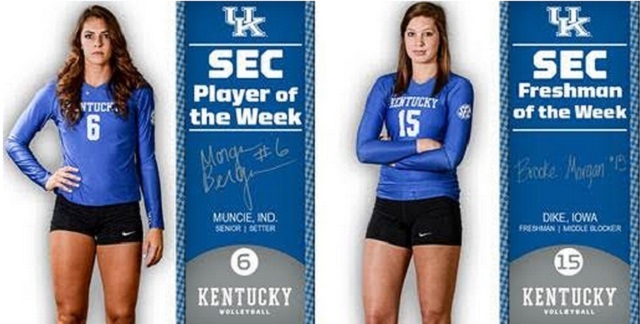 BIRMINGHAM, Ala. – Senior setter Morgan Bergren and freshman right side hitter Brooke Morgan were named Southeastern Conference Players of the Week it was announced by the league office on Monday. Bergren was the league’s top performing player and setter, while Morgan hauled in Freshman of the Week accolades. It is the first such honor of the season for Bergren, and the second such accolade for Morgan. The dynamic duo helped lead the Wildcats to a 3-0 sweep of No. 22 Arkansas on Wednesday – UK’s only competition on the week. With the win, Kentucky took over sole possession atop the standings in league play at a perfect 5-0. Bergren helped guide the Kentucky offense with 32 assists on 42 of the team’s kills. She registered her second double-double of the season with the 32 assists and 11 digs. Bergren found a way to get everyone involved in the offense, with five different players recording five or more kills. Bergren contributed five kills as well. She also assisted at the net with three of UK’s eight blocks. With the 11 scoops, she tied Anni Thomasson for the most on the team in the match. The senior from Muncie, Ind., has now logged 3,288 career assists and ranks No. 2 all time in the 25-point rally scoring era at Kentucky. With the three rejections, she moved into seventh place all-time in the rally scoring era with 208 total in her career. Morgan had nine kills and four blocks in the win over the Razorbacks. She averaged 3.00 kills per frame – well above her season average of 1.94. She utilized a .353 attacking clip in the win, and also added 1.33 blocks per set en route to her second career Freshman of the Week honor. UK will return to action with a road trip to Auburn, Ala., to meet the home standing Tigers on Friday at 8 p.m. ET. Kentucky will then return home on Sunday for its second matchup of the season with No. 17 Florida at 1 p.m. UK took down the Gators in four sets in the opening weekend of league play. It was the first win in Gainesville, Fla., for the Wildcats since 2009.